This is an amusing film that contains hilarious scenes , noisy action , suspense , thrills , dogfighting and may other things . Beginning in the air over the Western Front during 1916 , where ever shows up a young corporal Hitler , the picture moves from Paris to the 1936 Summer Olympics in Berlin . 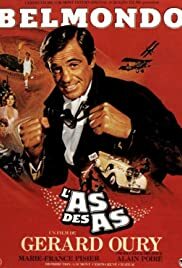 It is a highly entertaining caper set in WWII Germany , where our hero , Jo (Jean Paul Belmondo), must help some pursued Jews and a little boy called Simon Rosenblum and being reluctantly supported by a journalist (Marie France Pisier) and a Nazi officer who became his friend in World War I , during their period as contender pilots . Meanwhile , Gestapo and Nazi troops on their heals . The French boxer named Jo Cavalier is charmed by a kid who asks his autograph on the train to Berlin for the Olympics in Hitler's Germany ; when he results to be a Jewish child ; as Jo attempts to save Simon and his family . Later on , there take place several adventurous escapes to Switzerland and chased by nasty Nazis until that the group arrives in a countryside mansion which turns out to be the Hitler (Gunter Meisner) refuge -Berchtesgaden- . This fun movie packs thrills , emotion , intrigue , exciting flying scenes , lively performances , spectacular WWII planes and a moving finale . The film includes documentary footage of 1936 Berlin Olympic Games and images about American sprinter Jesse Owens . In this action comedy Belmondo steals the show , as he runs , bounds and leaps ; he jumps over balcony , cars and executes his own stunts , braving impossible odds in roller coaster-style . Enjoyable acting by main star names , Jean Paul Belmondo and Marie-France Pisier as Gaby , an attractive reporter . Special mention mention to Gunter Mesneir in a double role as Adolf Hitler / Angela Hitler , he is frankly hilarious as Hitler's jealous sister . Sympathetic acting by the young boy Rachid Ferrache , he is an adorable young fan as well as a Jewish orphan in danger of persecution . 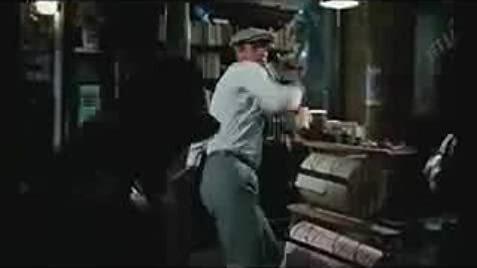 But Belmondo steals the spectacle , as usual at the time , he runs , hits , bounds and leaps ; Belmondo makes as his own stunts as well as Jackie Chan , he jumps over buildings , drives rapidly automobiles and pilots planes . Because of its huge advertising campaign on bill boards and in metro stations 25 French critics called moviegoers to boycott L'As Des As . They argued that Belmondo would displace smaller, more important movies like Jacques Demy's Une Chambre in Ville. Then , Belmondo said in an interview: "Critics say that my movies won't last. Who cares? I live now." Jolly and enjoyable musical score by Vladimir Cosma , including catching leitmotif . Colorful as well as atmospheric cinematography by Xaver Schwarzenberger . The picture was successful at box office , ranking second highest grossing movie of its year in France beaten only by E.T. Broke the opening admissions record in Paris selling 463,028 tickets in its first week , a record at the time . The motion picture was well directed by Gerard Oury . He was a good actor , writer and director expert on comedy . Gérard Oury was born 1919 in Paris as Max-Gérard Houry and died in 2006 Saint-Tropez , he was married to Michèle Morgan . Being especially known for The escape (1978) , The mad adventures of Rabbi Jacob (1973), Delusions of Grandeur (1971) , The sucker (1965) , The Great Stroll (1966) and Lévy et Goliath (1986) .L'as Des as" or "Ace of Aces" resulted to be one of his best films . Worthwhile watching .